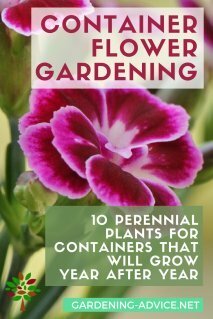 Learn How To Grow Flowers In Containers And Flower Beds. 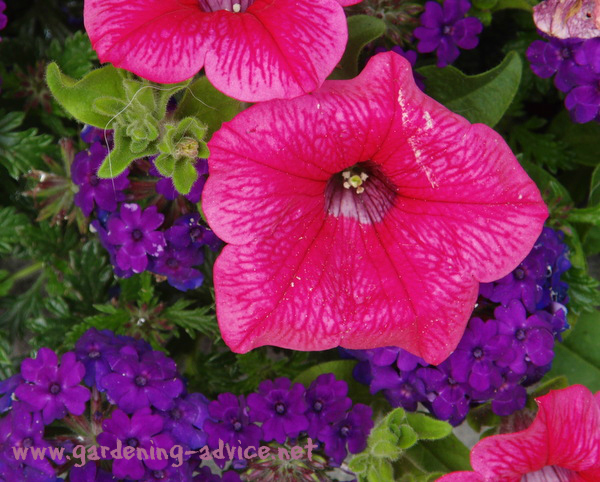 Planting Annuals Adds Sparkling Color To Your Garden. Annual flowers add a finishing touch to your flower borders, containers and flower boxes. 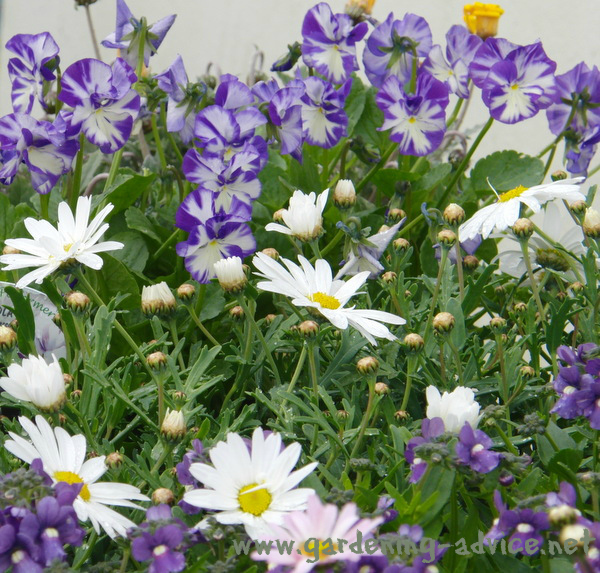 Planting annuals will bring the summer feeling to your garden. 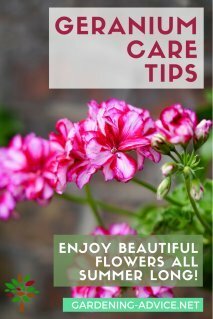 You should always have some annual flowers handy to fill gaps in borders and pots. 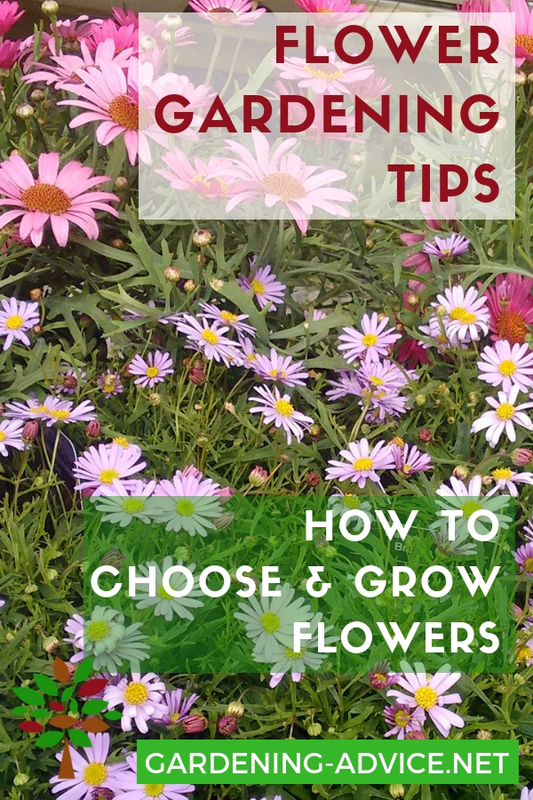 Flowers grown from annual flower seeds are a cheap alternative to shop bought flowers. Some of my favorite easy-grow annuals that add a load of color are Nasturtiums, Violas and pansies, Sweet Peas and Poached Egg Plant (Limnanthes douglasii). What I like best about those plants is that they self-seed and appear again the next year if they like the place. Just be careful when weeding. The flower seedlings can just look like weeds! 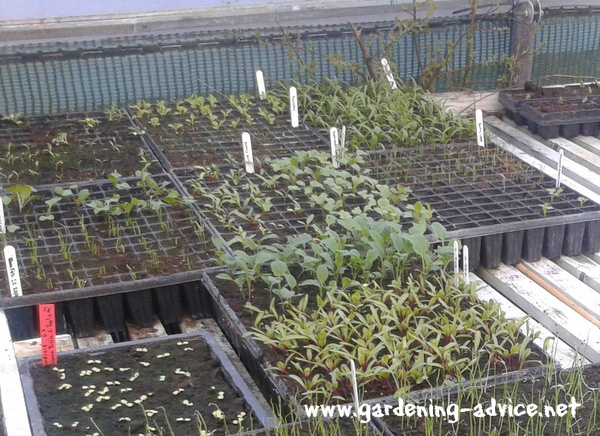 Seed trays or a variety of small containers. They should, of course, be clean and disinfected. 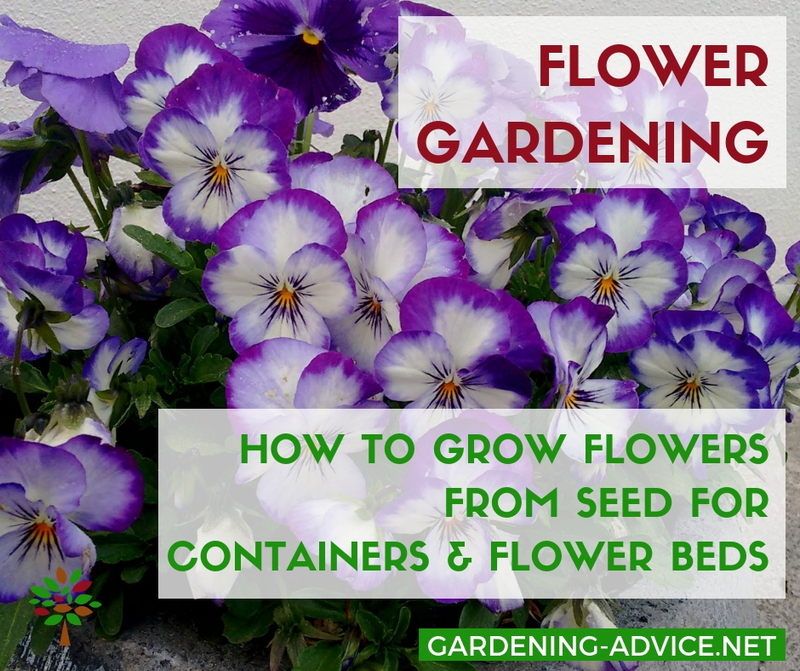 The perfect time to sow your flower seeds is in the spring. 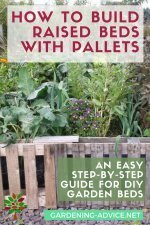 Fill the seed trays and pots with the fine potting mix. Level it out and firm lightly. Spread the seed evenly over the compost and cover with a layer of fine compost. As a guideline use a layer that is about twice as thick as the seeds. Firm the potting mix and water with a fine rose. Here are more tips for starting seeds indoors. Bigger seeds like nasturtiums or lupins can be planted into small pots or plugs. The best place for germinating the seeds would be a greenhouse but you can also place them on a window sill or a conservatory. In cold climates you need a heated greenhouse or soil warming cables for germination. 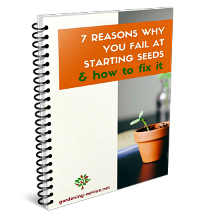 If you don't have enough heat to germinate the seeds try a DIY seed incubator box. Keep the compost slightly moist but not too wet. After a few days the seedlings will emerge. 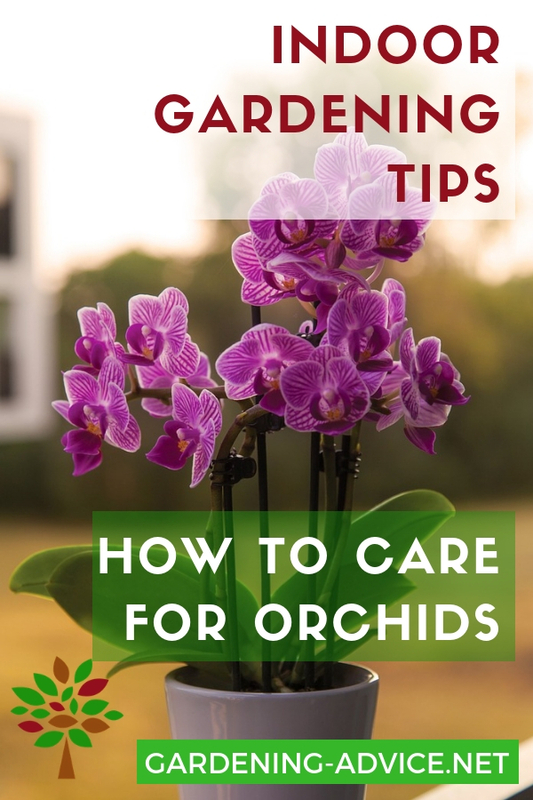 Depending on the species you can transplant them directly into the soil once they are big enough and there is no more danger of frost or you can pot them on into bigger pots. You can also sow seeds directly into beds outside. 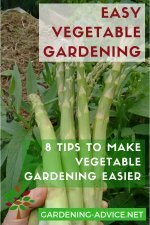 The soil needs to be well prepared and weed free. Choose a sunny location with a free draining soil. If needed add a balanced organic fertilizer before you put the seeds out. You can either sow in drills or broadcast. Check the information on the seed packet for the appropriate method. Cover the seed lightly and water with a fine rose. Keep the seed bed moist and if needed control control slugs and snails. Thin out the seedlings and remove the weaker ones. This will give them an even spacing and enough room to grow. Which Kinds Of Flowers Should You Choose? 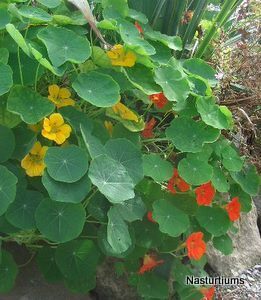 Nasturtiums can be grown in the ground or in pots. 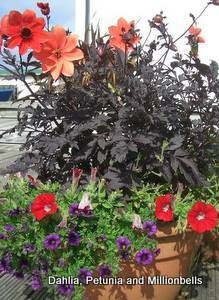 If you want to grow them in a container choose a more compact variety. 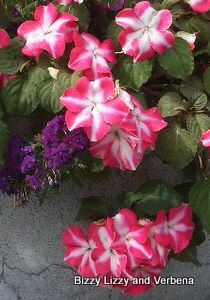 They are a great plant for covering up larger areas and to grow up or down walls. They usually self-seed and grow again the following year. You can sow them directly into the ground or start them off in pots inside. Nasturtiums produce edible flowers. 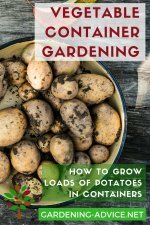 Learn how to grow them here! Fuchsias are easily grown in containers. Choose the bedding type fuchsias for this purpose. It is best to buy a plant in your local garden center. Fuchsias come in lots of different colors and shapes. The upright varieties can be planted in flower beds as well as pots. 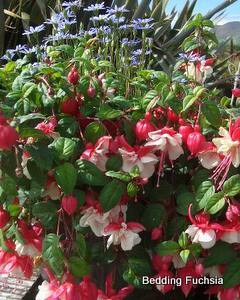 Trailing fuchsias are great in containers or window-boxes. They are also suitable for more shaded areas and coastal gardens. The cheerful Bizzy Lizzy is a fantastic plant for flower beds and pots. The great thing about them is that they even flourish in a shaded spot. They come in white, shades of pink and red. A pot filled with Bizzy Lizzies and Lobelias is the best combination for a north or east-facing window-box. 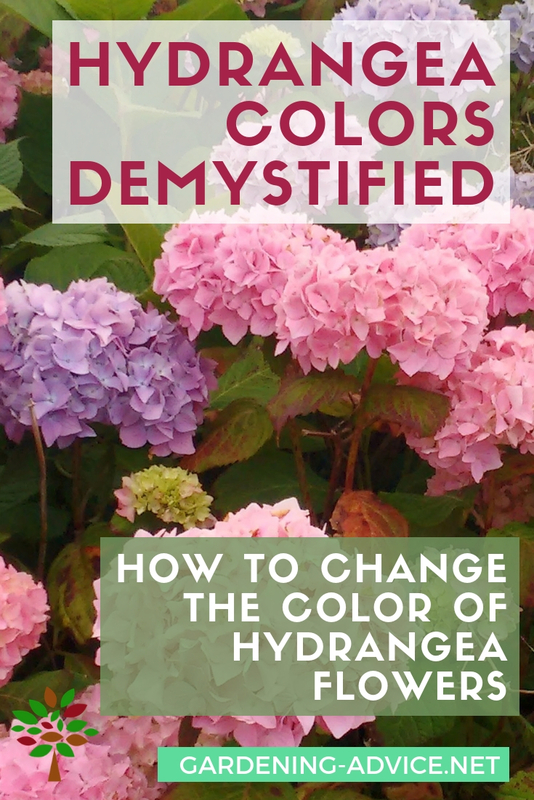 Diascias come in different shades of pinks, white or coral. They flower non-stop all summer and are self-cleaning! A great alternative to the old Geranium in my opinion. They are suitable for pots or ground in sun to part shade. This is a perennial dahlia with dark foliage. It is under planted with red petunias and millionbells. 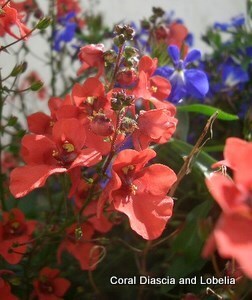 Lobelias are great fillers for any kind of containers. You can get them either trailing or upright. They are available in blue, white, pinks or red. The upright lobelia varieties are a great edging plant for flower beds and borders. 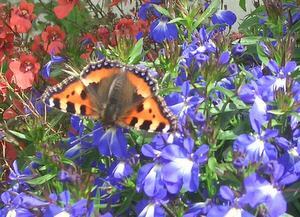 Lobelias are easily grown from seed. You can also buy them in six-packs from your local garden center. 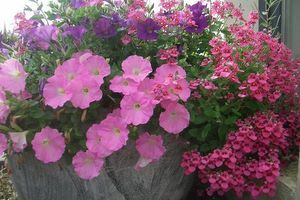 Petunias are available in all colors and shapes, from trailing to upright. They are very free-flowering and require regular watering and feeding. The pink flowers on the right are Diascias. I like to combine different sizes and shapes of flowers. I am a big fan of violas! Their flowers are so cheerful and happy looking. Again they are great in pots or in the ground. 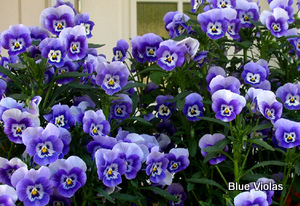 Grow them the same as Pansies. Violas self-seed freely in the garden and appear everywhere in different colors. Watch out for the perennial violas. They have a lovely scent and come year after year. 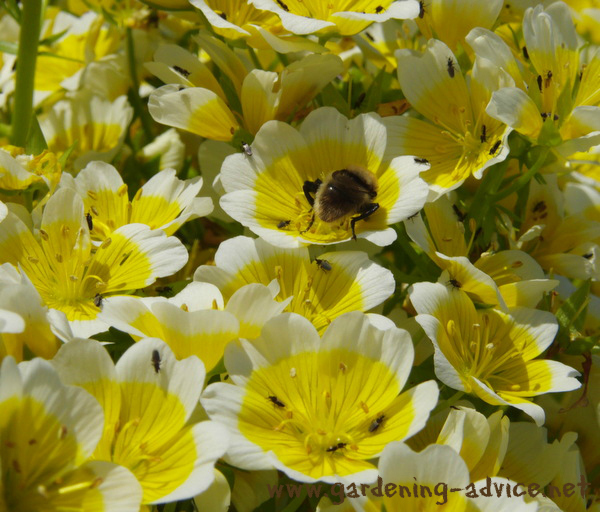 Poached Egg Plant (Limnanthes douglasii) is a great filler and ground-cover plant for flower beds. They start flowering in late spring. Once they have finished flowering they die off but the literally regrow immediately from their seeds. 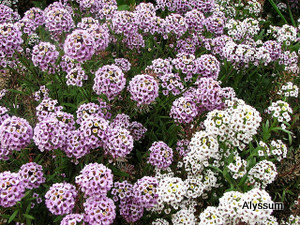 Alyssum is another low-growing filler plant for pots or flower beds. It is great for edging borders or under planting roses. The flowers are sweetly scented and they often self-seed. Bees and pollinators love this plant! 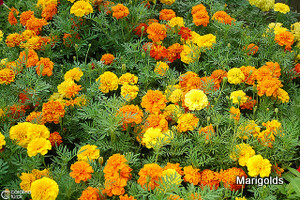 The orange or yellow flowers of marigolds add a warm splash of color to containers and flower beds. Tagetes are an all-time favorite of many gardeners. 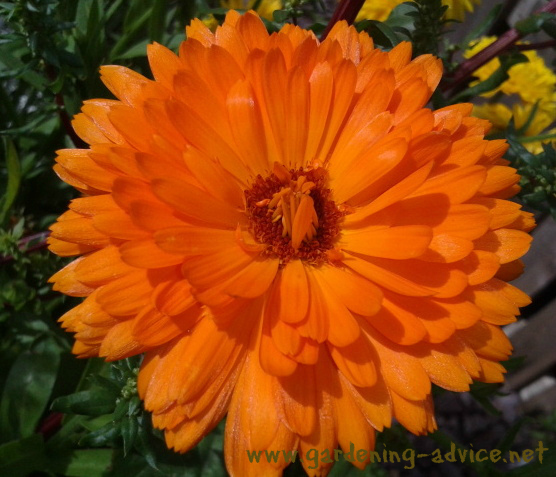 Calendula is a great plant to mix into your vegetable or herb garden. Of course you can add them to flower beds, too. The orange flowers are edible and sometimes self-seed. The petals can be spread over salads. Calendula is also a great medicinal plant. 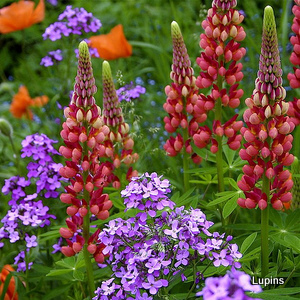 Lupins are short-lived perennials that are easily grown from seed. You can get them in red, yellow, blue and pink. They are a great addition to any flower bed. Learn more about this nitrogen-fixing flower here!